What has always intrigued me about Russian culture and history is how under a thousand years of autocracy and dictatorship, such amazing men and women have emerged. There is a painting from Soviet times that illustrates this. Across a bleak land a black paved road stretches straight to the horizon, a dark silhouette of a modern high-rise city. Pushing up through the cracks in this road are leaves of grass and budding flowers. Those vibrant plants reaching for light through the cracks represent the great writers, poets, composers, painters, filmmakers, and other people of the performing arts. We know the names of a many, but there were and are so many more talents in Russia who kept being creative under the pressure from the Soviets, and their humble work was not wasted, as they kept the great culture alive. Petr Shelokhonov was one of them. On my first trip to the then Soviet Union in 1991, I marveled at these artists in the secret lofts, their crumbling dachas, or just the privacy of the kitchen table; I marvelled at what they were happily doing in the ruins of the Soviet Union – these budding plants. We know the strife of these champions of freedom. The work of writers and actors got focused attention from the Soviet guardians of their power. I have managed a business in Russia and lived there. I have met more than few of these often surviving humble greats. In St. Petersburg in 1996, I walked by a horse-carriage with a woman and other actors in 19th century dress standing about. It was the filming of “Anna Karenina” in which Petr Shelokhonov was cast. His best known film role was co-starring as Cossack Severian in a three-hour epic film Dauriya. 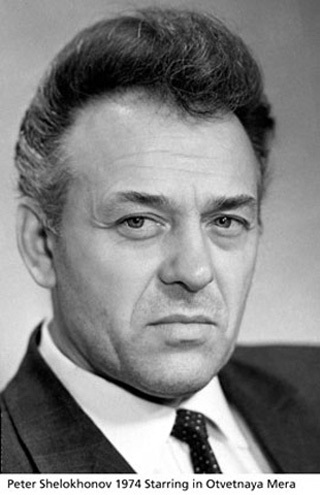 Only a few of his films are available today, while many other works did not survive the turbulent events of Soviet and Russian regimes. Petr Shelokhonov started his acting career during the Nazi occupation in WWII when he was making parodies of Hitler and the Nazis to lift the spirits of his fellow survivors. After the war he was drafted in the Red Navy and served with the Baltic Fleet. There he was giving performances on stage and on radio shows, then continued acting in Siberia. In many roles he had to play a Soviet officer, or a revolutionary and did so with tongue-in-cheek as he also listened to the opposite side, such as the BBC, Voice of America, and other international sources. It was his love of freedom that led him to take the death-defying chances necessary to assure his acting career, and to create a range of characters marked by truth, depth, and beauty. Photographs of his stage roles show a variety of characters displaying nuanced emotions and a remarkable range. In the course of his career spanning 50 years, Petr Shelokhonov worked in theatre, in film, and on television, and played over 150 characters from different periods and cultures, ranging from the Shakespearean prince Hamlet, to the Soviet dictator Lenin. The actor created such a range of characters thanks to his gift of transformation. He was equally convincing delivering refined noblesse and reserved energy of passion, with deep penetration in the gist of each character, entertaining the viewer with his charm and mastery of acting, and performing with the full power of his talent. We Americans often don’t appreciate the cultural under-structure of the rest of the world. European, Russian, Asian, African, and Mediterranean peoples live with a highly original, rich, and multi-dimensional worlds of a vertical culture, while many of us in America live in a horizontal culture. But in the rest of the world, the centuries of language, geography, religion, and resulting social, political, and economic strains make a special environment conducive to breeding cultural creatives. Petr Shelokhonov was surely one of these who elegantly portrayed for us the cultural heritages of Europe and Russia.